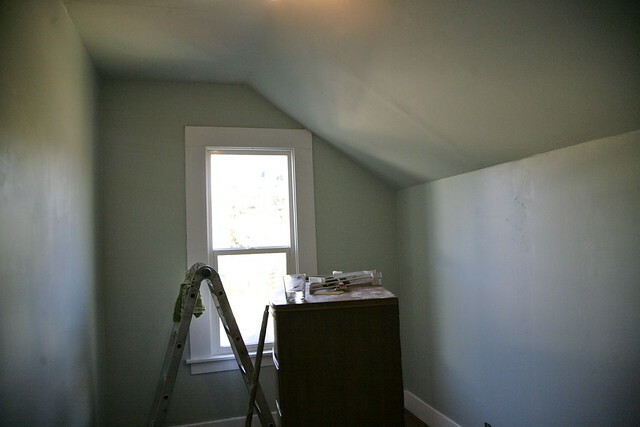 Inder Loves Folk Art: Kids' Bedroom: Progress! Just a quick update to show you one project that has taken up an awful lot of my "free" time lately. 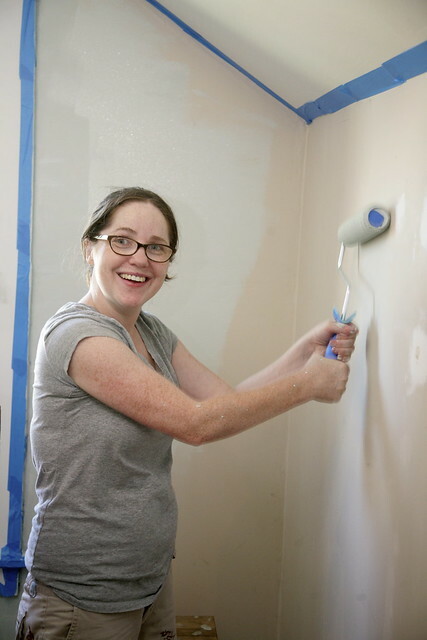 I spent most of Labor Day weekend painting our tiny second bedroom upstairs, which will eventually become a shared bedroom for the kids. After looking over my shoulder at my Pinterest board of kids' spaces, Joe decided that he wants a big world map on his wall (most of my map pictures were added after he said that, as I looked at different ways to incorporate maps into decor). Joe is currently really into maps, and being a map person myself, this is an interest I definitely want to encourage! So after much deliberation and polling all my friends on Facebook (bright white? light blue? yellow?) I decided go with a light blue - like the ocean in an old map. Several paint samples later, and it turns out that all light blues are not created equal. I don't consider myself to be especially picky about paint colors (maybe I'm kidding myself), so I was surprised at the strength of my dislike for my first set of samples. In our older house, with the rich dark hardwood, bright/light pastels look ... just awful! Who knew? I realized I needed something more muted, with more gray/brown in it. So I polled my friends on Facebook. Again. What can I say? I'm a Libra. "Decisiveness" is not one of my strong qualities. My decision-making process involves a lot of hemming and hawing and trolling of Pinterest and blogs and soliciting of advice, usually followed by me ignoring said advice and doing whatever I feel like, much to the annoyance of my friends, who spent ridiculous amounts of time talking me through the whole thing. But, hey, I really want to know what other people think! But here, one of my friends seriously came to my rescue. "Try Sherwin Williams 'Rainwashed.' Or maybe 'Sea Salt,'" she commented. Do you have friends who not only know color generally, but can nail down exactly the shade of paint you need? It turns out this particular awesome friend, Karen, is considering going into interior design. The woman knows paint. Samples were duly procured, and ... yes. Oh gosh, Rainwashed and Sea Salt are both so beautiful. Soft lovely green-blues with just the right amount of muted warmth to work in an old Victorian house with rich brown floors. So I decided to do the walls in Rainwashed and the ceiling in Sea Salt, but it turned out you can't tell the difference and the room looks like it's all one color. Ha! Oh well! I know it's not a huge difference, but it looks so much nicer and cleaner now! 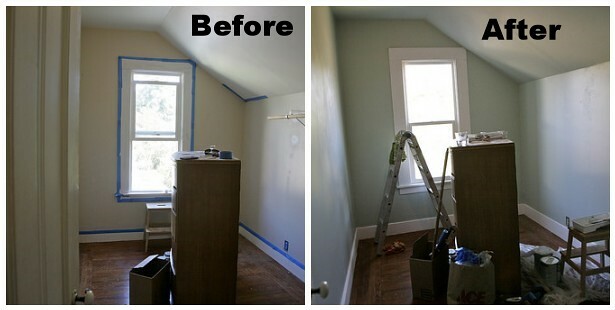 There is really nothing like painting the baseboards and door to make a room seem suddenly clean and bright! The actual painting went pretty quickly, even though I did it all myself. It's a small room (but the ceiling is high on the left!). I was so excited to be fixing up this space, I was actually freakishly happy most of the time, despite the fact that I was working really hard. See, most cheerful painter ever, right? Until I got to the ceilings, anyway. Painting 10 foot ceilings is not a fun or cheerful job. But again, luckily the room is really small. So that's where it is at this point. There is still a lot of work to be done - paint needs to be scrubbed off the floors and I need to screw on new outlet covers and I want to change the light fixture and furniture needs to be moved in, etc., etc. Also, I need a really big map! The current tentative plan is to put the map on the higher wall to the left, and the bunk beds under the dormered ceiling to the right. Then I will figure out some storage for clothes, books, and toys. Me: "You know [BFF] sleeps in his own room, and has lots of fun toys in there, right?" Joe: "I don't want to sleep in the other room. I like sleeping in my bunk bed near you and Daddy." Me: "Daddy would still snuggle you every night, even if your bed was in the other room." Joe: "I don't want to put my bed in the other room." Okay ... so this may be a bit of a long term project! That's okay. We'll get there eventually. In the meantime, the kids will have a lovely, light blue play space. So ... what kind of curtains should I do? Inder, I might totally steal your color choice for our half bathroom. I love it. We have a huge map on our dining room wall - which is actually now my sewing area. It's so useful for learning geography because it's so easy to point things out on a gigantic map when it's right there in front of you! :) I say painting is like a road trip. It also seems like a great idea at first. But 10 hours into it, it loses it's magic. (haha!) Maybe I'd better stick to small rooms to maintain my level of enthusiasm. High five to you, girl! Oh, and paint colours are so tough. I do sympathise! It's great when you have people who can just tell you what to do. The paint looks wonderful. I am looking forward to seeing how it all looks when finished. We just kicked the kids out of our room and they are now sharing and sleeping in their own room (We actually switched rooms). And the room looks awful unless you just look at my daughter's bed which is beautiful. I don't know what I can do it to pull it all together. We are trying to put all these toys in there too which don't fit. We maybe should have done what you did and fixed it up first.